Metabolic syndrome refers to the presence of a cluster of risk factors specific for cardiovascular disease. Metabolic syndrome greatly raises the risk of developing diabetes, heart disease, stroke, or all three. Abdominal obesity. This means having a waist circumference of more than 35 inches for women and more than 40 inches for men. An increased waist circumference is the form of obesity most strongly tied to metabolic syndrome. High blood pressure of 130/80 mm Hg (millimeters of mercury) or higher. Normal blood pressure is defined as less than 120 mm Hg for systolic pressure (the top number), and less than 80 mm Hg for diastolic pressure (the bottom number). High blood pressure is strongly tied to obesity. It is often found in people with insulin resistance. High triglyceride levels of more than 150 mg/dL. Triglycerides are a type of fat in the blood. Low HDL (good) cholesterol. Less than 40 mg/dL for men and less than 50 mg/dL for women is considered low. The NHLBI and AHA recommend a diagnosis of metabolic syndrome when a person has 3 or more of these factors. Experts don't fully understand what causes metabolic syndrome. Several factors are interconnected. Obesity plus a sedentary lifestyle contributes to risk factors for metabolic syndrome. These include high cholesterol, insulin resistance, and high blood pressure. These risk factors may lead to cardiovascular disease and type 2 diabetes. Other factors that may contribute to metabolic syndrome include genetic changes in a person's ability to break down fats (lipids) in the blood, older age, and problems in how body fat is distributed. Who is at risk for metabolic syndrome? Knowing your risk factors for any disease can help guide you to take the appropriate actions. This includes changing behaviors and being monitored by your healthcare provider for the disease. Age. You are more likely to have metabolic syndrome the older you are. Ethnicity. African Americans and Mexican Americans are more likely to get metabolic syndrome. African-American women are about 60% more likely than African-American men to have the syndrome. Body mass index (BMI) greater than 25. The BMI is a measure of body fat compared with height and weight. Personal or family history of diabetes. Women who have had diabetes during pregnancy (gestational diabetes) or people who have a family member with type 2 diabetes are at greater risk for metabolic syndrome. What are the symptoms of metabolic syndrome? Having high blood pressure, high triglycerides, and being overweight or obese may be signs of metabolic syndrome. People with insulin resistance may have acanthosis nigricans. This is darkened skin areas on the back of the neck, in the armpits, and under the breasts. In general, people do not have symptoms. The symptoms of metabolic syndrome may look like other health conditions. See your healthcare provider for a diagnosis. 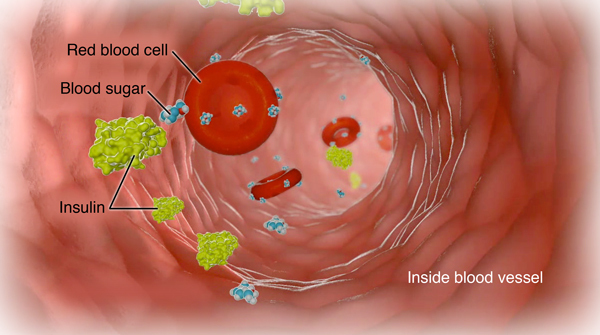 Increased blood clotting. This means you have more plasma plasminogen activator and fibrinogen, which cause blood to clot. Insulin resistance. This means you have type 2 diabetes, impaired fasting glucose, or impaired glucose tolerance. The impaired glucose tolerance test measures the body's response to sugar. Each organization has its own guidelines for using the above criteria to diagnose metabolic syndrome. How is metabolic syndrome treated? Here are the types of treatment that may be recommended for metabolic syndrome. Treatment usually involves lifestyle changes. This means losing weight, working with a dietitian to change your diet, and getting more exercise. Losing weight increases HDL ("good") cholesterol and lowers LDL ("bad") cholesterol and triglycerides. Losing weight can also reduce the risk for type 2 diabetes. Losing even a modest amount of weight can lower blood pressure and increase sensitivity to insulin. It can also reduce the amount of fat around your middle. Diet, behavioral counseling, and exercise lower risk factors more than diet by itself. Other lifestyle changes include quitting smoking and cutting back on the amount of alcohol you drink. Include a variety of foods in your diet. Use healthy fats. Polyunsaturated and monounsaturated fats may help keep your heart healthy. These healthy fats are found in nuts, seeds, and some types of oils, such as olive, safflower, and canola. When eating out, take part of your restaurant meal home. When dining out or ordering take-out food, ask for a take-home box or avoid super-size selections when you order. Many restaurant portions are too large for one person, so consider sharing an entrée. Or order an appetizer instead of a main dish from the entrée menu. Read food labels carefully. Pay close attention to the number of servings in the product and the serving size. If the label says a serving is 150 calories but the number of servings per container is 3 and you eat the entire container, you are getting 450 calories. Choose foods that are low in added sugar. Exercise helps people who are overweight or obese by helping to keep and add lean body mass, or muscle tissue, while losing fat. It also helps you lose weight faster than just following a healthy diet because muscle tissue burns calories faster. Walking is a great exercise for just about anyone. Start slowly by walking 30 minutes daily for a few days a week. Gradually add more time so that you are walking for longer periods most days of the week. Exercise lowers blood pressure and can help prevent type 2 diabetes. Exercise also helps you feel better emotionally, reduces appetite, improves sleep, improves flexibility, and lowers LDL cholesterol. Talk with your healthcare provider before starting any exercise program. Weight-loss surgery (bariatric surgery) is an effective treatment for morbid obesity in people who have not been able to lose weight through diet, exercise, or medicine. It may also help people who are less obese but who have significant complications from their obesity. Studies have shown that gastric bypass surgery helped lower blood pressure, cholesterol, and body weight at one year after the procedure. Weight-loss surgery can be done in several ways, but all are either malabsorptive, restrictive, or a combination of the two. Malabsorptive procedures change the way the digestive system works. Restrictive procedures are those that greatly reduce the size of the stomach. The stomach then holds less food, but the digestive functions remain intact. What are the complications of metabolic syndrome? Metabolic syndrome greatly raises the risk of developing diabetes, heart disease, stroke, or all three. Can I prevent metabolic syndrome? The best way to prevent metabolic syndrome is to maintain a healthy weight, eat a healthy diet, and be physically active. Your diet should have little salt, sugars, solid fats, and refined grains. Metabolic syndrome is a lifelong condition that will require changes in your lifestyle. If you already have heart disease or diabetes, follow your healthcare provider’s recommendations for managing these conditions. Metabolic syndrome is a condition that includes a cluster of risk factors specific for cardiovascular disease. The cluster of metabolic factors include abdominal obesity, high blood pressure, impaired fasting glucose, high triglyceride levels, and low HDL cholesterol levels. Management and prevention of metabolic syndrome include maintaining a healthy weight, eating a healthy diet, eliminating the use of cigarettes or other tobacco products, and being physical active.